Oh She Glows, created by Angela Liddon, is one of the biggest and most well-known vegan blogs out there, for good reasons: her writing style is warm and relatable, her recipes are simple but well-designed and her photography is breathtaking. After being a regular reader of OSG for a couple of years, I was lucky to meet Angela at Vida Vegan Con last May and she was just as lovely in person as she is online. So when the kind folks over at Penguin mailed me a copy of Angela’s new cookbook to review, I couldn’t wait to crack open this new title that’s already made it onto The New York Times Best Seller list. When I first flipped through The Oh She Glows Cookbook, the most prominent feature was Angela’s trademark photos, which accompany almost every recipe (100+) inside. While reading through each recipe and headnote, I couldn’t help but smile while looking at each carefully crafted page that is packed with dishes that joyfully embrace real, whole-food ingredients and celebrate freshness, color and creativity. Although there are easily 20 recipes I bookmarked while initially reading through it, I started off with making Angela’s Walnut, Avocado & Pear Salad with Marinated Portobello Caps & Red Onion. Simple in approach and ingredients, but well thought out in its combinations of flavors and textures, this salad is a breeze to put together, tastes fantastic and looks beautiful on a plate. 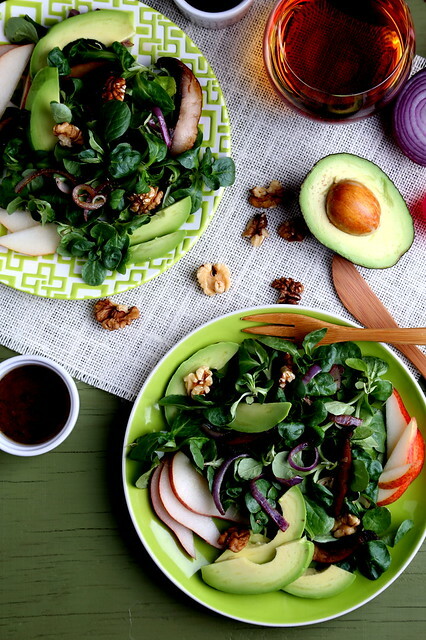 After the shoot, Jeff and I ate every last bite, swirling around the last bits of avocado and walnuts with Angela’s homemade balsamic vinaigrette recipe. Because I loved this recipe so much, I’m excited that Penguin has not only allowed me to share it here, but is also offering one free copy of Angela’s book to one lucky reader through this post! To enter, just leave a comment below sharing the name of one of your favorite recipes from Oh She Glows or your favorite whole food ingredient, including your email or some way to contact you in your comment. I’ll randomly choose and announce the winner on April 8. (Shipping is limited to US/Canada only.) Good luck! Congrats to Ashley, the winner of this giveaway! This salad was inspired by a dish at a local restaurant where my girlfriends and I meet for lunch once a month. With buttery pear slices, grilled marinated red onion, and portobello mushrooms, toasted walnuts, and creamy avocado, it’s a delicious mix of my favorite flavors and textures, and it’s filling, too. Each portobello mushroom packs in around 6 to 8 grams protein, so add one or two and you have yourself a protein-packed salad that will go the distance. Gently rub the outside of the mushrooms with a damp towel to remove any debris. Remove the stems by twisting the stem until it pops off; discard it or freeze for another use, such as a stirfry. With a small spoon, scrape out and discard the black gills. In a large bowl, combine the mushroom caps, onion, and half of the balsamic vinaigrette and toss until fully coated. Marinate the mushrooms and onion for 20 to 30 minutes, tossing every 5 to 10 minutes. Heat a grill pan over medium-high heat. Place the mushroom caps and onion on the pan and grill for 3 to 5 minutes per side, until grill marks appear and the vegetables are tender. Reduce the heat if necessary. Remove the pan from the heat and set aside until the mushroom caps are cool enough to handle, then slice the mushroom caps into long strips. 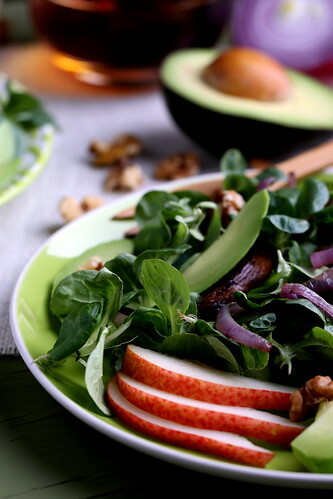 For each salad, place a few handfuls of mixed greens in a large bowl and top with half of the chopped pear, avocado, walnuts, and grilled mushrooms and onion. Drizzles with some of the remaining balsamic vinaigrette and enjoy! In a small bowl, whisk together all of the ingredients or simply combine them in a jar, screw on the lid, and shake. This dressing will keep in an airtight container in the fridge for at least 2 weeks. Feel free to adjust this dressing to suit your own taste preferences. I tend to like an acidic bite to my salad dressing, but if you prefer less acidity, simply decrease the vinegar or increase the sweetener. Have fun and play around with the amounts! Thank you for your beautiful review and kind words! 🙂 Your photos are gorgeous. I'm so happy you are enjoying the cookbook so far. It's my pleasure, Angela! I cannot wait to cook my way through your book — it's so beautifully done! I love Oh She Glows! My favourite recipe has to be "The Nourish + Glow Miracle Bowl". Such a wonderful recipe, simple, healthy and delicious. I can be reached at rajan.neeraja@gmail.com. Hope I win her cookbook! It's so exciting to see one of my favorite bloggers come out with a cookbook! My favorite recipe from the blog is the Caulipower Fettuccine Alfredo. http://ohsheglows.com/2014/01/20/cauli-power-fettuccine-alfredo-vegan/ I'm always looking for ways to cook cauliflower and this was great. Avocado is my all time FAVORITE whole food ingredient. It makes everything instantly better! Excited to dive into thecookbook! Oh she glows is my favourite recipe site right now! it's exactly how I like to eat and cook, whole, gluten free, vegetarian but without pounds of incredibly expensive nuts or other expensive ingredients. simple good whole food! I love the cauli-power alfredo sauce. surprisingly rich and incredibly satisfying. I'd LOVE a copy of the book! I love every one of Angela's recipes that I've made, but I especially love her avocado/basil pasta sauce. Using Angela's recipes easily becomes addictive!! I have turned time and again to one of my very favorite pasta dishes, the avocado / basil, when I'm in a hurry but still want a healthy, yummy meal. Huge treat having an all vegan cookbook that never fails to deliver the best! Bananas are so incredible in their versatility and natural sweetness. Can't believe I grew up not liking them! Yum! I'll try this next. I have so far eaten the life affirming nacho dip, the power miso bowl, several dressings and the creamy avocado pasta – all of it delicious!!! Love this book. So many great recipes it's hard to choose just one. I have really enjoyed the Taco Fiesta Potato Crisps. I love Angela's Twix bars. And her edamame hummus! And her cauli-power fettuccine! Pink Power Detox Smoothie! It's a wonderful way to welcome spring and spring colors back to this side of the earth! I'd love to have this book to help me on my journey! I'm not sure if it's in her recipe book, but Angela has the most amazing recipe for vegan oatmeal raisin cookies. Even my husband (a non-vegan) loves them! Our favorite way to eat them is for breakfast, dunked in our coffee. Sooooooooo good! I've recently just started actually enjoying avocado, and now I can't get enough! So far, my favorite recipe has been the Lentil Mushroom Walnut Balls with Cranberry-Pear Sauce. I'm a sucker for appetizers. I'll make 3 and call it dinner! She has an amazing selection. My favorite whole foods is probably raw nuts. What a great giveaway! I love her chocolate peanut butter cups in jars recipe. I actually made them into a full-size pie, and after one bite by football-playing, meat-loving brother requested the treat for his birthday! I love the Italian bean balls with spaghetti squash! My favorite would have to be the herbal green monster, though that green warrior she posted recently might change that. I've been such a fan of hers for a long time, her photography being the number one reason. When my carnivore friends start poking at my eating habits, I just send them one of her links. "Ya want it, don't cha?" Love Ange, love Medjool dates. Thank you for the recipe and giveaway! My favorite of Angela's recipes is her classic overnight oats. I love Oh She Glows's avocado pesto! Also the butternut squash cheeze sauce! I love her blog! One of my favorite recipes is the raw pad thai, it is amazing. I absolutely adore avocado, as whole foods go. I can be reached at DanielaN04@hotmail.com. My daughter and I love making the Cauli-power Fettuccine Alfredo. It is so delicious! I have to agree with my mom, the Cauli-power Fettuccine Alfredo is so good and we're making it again this week! I've been wanting this cookbook forever, it seems! I'd have to say my favorite recipe is the avocado pesto pasta. I love her Green Monster shakes! They are a summer breakfast staple!! Oh She Glows is the first vegan food blog I fell in love with. As for a favorite recipe, I'd have to say that would be her Butternut Squash Mac N' Cheez–it's the recipe that convinced me I could give up dairy and still eat some ridiculously amazing food. And, better yet, this food didn't leave me feeling bloated and gross afterwards. So thanks for sharing a rather tasty-looking recipe. And thanks to Angela for giving us a whole book filled with deliciousness! Angela's blog introduced me to the green monster and really helped transition me to the vegan diet! I really really really want the cookbook! The Tahini Lemon dressing is a constant go to, especially massaged on kale or chard. Never fails to wow. Angela's GF crispy PB cookies is a family fave!!! Butternut squash mac and cheese! My favorite recipe and my favorite ingredient – butternut squash! My favorite recipe on Oh She Glows is the Easy Vegan and Gluten-Free Pancakes. They sound amazing! I love cooking with beans and nuts, and my favourite recipe(s) would be… basically every dessert ever done by Oh She Glows. Right now I think my favorite whole food ingredient is oats. They are great in baked goods, can be ground into a flour to be used as a base or thickener. Thank you for this wonderful give away. My favourite recipe is the caulipower alfredo. I love the cauli-power fettuccine and for whole foods I love avocados! Favourite Recipe: Butternut Squash Mac and Cheese. A delightful combination of all my favourites! Favourite Whole Foods Ingredient: If we restrict the field to just superfoods (no farmer's market hauls, CSA finds, beans, nuts, seeds … I'm awash with indecision!) I'd say chia seeds. They are magical, and remind me of my favourite pet: the Chia Pet! I will always love the first Oh She Glows recipe I ever made-it was a chocolate mousse tort. Mmmmmm. I LOVE LOVE LOVE the Oh She Glows blog and I read it religiously! My absolute favorite product is cauliflower…I make it a hundred ways! Oh She Glows lightened up Tahini Lemon dressing has become my go to dressing for everything and sparked my obsession with Tahini…then again most of her recipes have introduced a new obsession into my life (raw almond butter cups anyone). I'd have to say my favourite so far has to be her Green Warrior Protein Smoothie. So good! 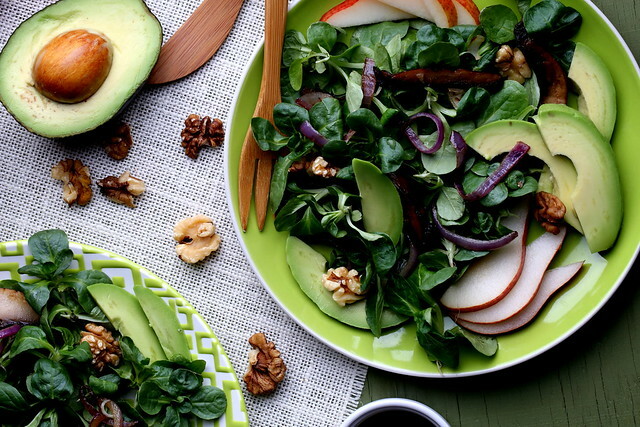 One of my favourite whole food ingredients is walnuts, so this salad looks amazing! I love all of her overnight oats recipes! Thank you for the giveaway! I love all of her overnight oats recipes! Thanks so much for the giveaway! I love Oh She Glows Cauli Flower Fettuccine Alfredo and Butternut Squash Mac N Chez-It recipes. What a awesome book! I love all of the larabar recipes– like this one: http://ohsheglows.com/2008/12/08/homemade-banana-bread-larabars/!!! My favorite from is her Potato Nacho Plate!! So yummy! I love her Easy Enchiladas and her Butternut Mac n Cheese. It's hard to pick just one OSG recipe, but I do use the Green Monster smoothie recipe all of the time so I guess that would be it!! I haven't made it yet, but the Peanut Butter Cups in a Jar on her website looks too good to be true! There are so many recipes of Angela's that I make over and over, but my favorite is probably her Butternut Squash Mac n Cheeze. Even my husband, who is always skeptical about what he calls "fake" cheese, loves it. I am so glad her book is doing so well–her success is extremely well-deserved! I love the Blueberry Pie Banana Overnight Oats….keden66@aol.com! Thanks for the give away. My favorite whole food ingredient is sweet potatoes. I love avocados as a whole food ingredient. They are so creamy and go well with lots of things! I make the lasagna with basil cashew cheese from Oh She Glows every winter at least twice. Delicious! I love chickpeas as a whole food ingredient. In hummus or whole. My husband and I love Angela's enchilada casserole. We make it at least once a month. What a great giveaway! I loved bringing Vegan treats to work to share with my coworkers. Oh She Glows sugar cookies are always a big hit! rsmccart [at] gmail [dot] com. I love all of the overnight oats recipes – great fuel for running! I love the toffee granola bars on Angela's blog – an oldie but a goodie. Avocado is by far my favourite whole food, and I love adding it to salads. Oh!! So exciting!! My favorite from the Oh She Glows site is the overnight oats. What a great idea!! Thank you! We love her Apple Pie Oatmeal and Roasted Red Pepper Hummus. Thanks! The Avocado Pasta is one of my all-time favorites! Thanks for the chance to win a copy of this gorgeous book! I love her smoothie and options for healthier "treat" foods. I love eggplant as a favorite whole food ingredient. Also spinach, cashews, and sweet potatoes. Oh my goodness, that salad looks like it's about to be my favorite recipe. As a nursing mom, I'm enjoying lots of healthy high calorie foods – especially nuts and avocados. Yum! I think the homemade kale chips are a pretty great recipe. Especially when a tiny bag of kale chips costs $5 at the grocery! My email is freshfromjen(at)gmail.com. Fave whole food ingredient = quinoa! The Oh She Glows caulipower fettuccine alfredo is my go-to comfort food because I don't feel too guilty eating it 🙂 I would love to get my hands on her new book! I've heard rave reviews. I'm a huge fan of Angela and Oh She Glows! I would love the opportunity to win a copy of her new cookbook. My fave go to recipe is her Pumpkin Pie with Gluten free pecan crust. A real crowd pleaser! I love the Back on Track Green Monster smoothie. I hadn't thought to put cucumbers in my smoothies. And I don't know which I love more, the smoothie recipe or Angela's story of botching her husband's haircut. Very funny! I fell in love with Oh She Glows bars and bites! I would love to try any and all of the recipes in her cookbook! I loved Angela's take on a chocolate chip cookie dough Blizzard! Would love to win this cookbook! Probably my favorite Oh She Glows recipe (and most frequently used) would be the Quick & Dirty 5-ingredient Cheeze Sauce! So easy and so good! My email is sheridanposey [at] yahoo [dot] com. Thanks! I fell in love with the OSG blog a few years ago and have made many of her delicious recipes. I have a particular fondness for her raw cookie dough bites! I discovered OSG a couple of years ago and one of my favourite recipes is her scalloped basil tomatoes!! SO GOOD — especially when you're craving healthy comfort foods in the colder months! I'm so excited to get my hands on a copy of this cookbook!! !